If you had ever told me that I would regularly eat in the summer an open faced sandwich made with cottage cheese; I would have laughed in your face. "I hate cottage cheese." "Cottage cheese is tasteless and eaten to punish one's self for having gained weight." But after I tasted Dorie's Dieter's Tartine I was sold on cottage cheese. Now I do buy fresh cottage cheese that has flavor, but it's the combination of ingredients in this sandwich that brings me back to it time and time again. It is light, yet satisfying: tomatoes, cucumbers and chives... I eat this tartine for lunch when I have over indulged at a summer party, and I eat it for lunch when I start to feel that I am gaining some weight from too many barbecues and beer. Any time I am asked to bring a dessert to a picnic I make the Sable Breton Galette with Berries. It is simple to make. It is very patriotic and impressive looking, and it doesn't get soggy sitting out in the sun. Berries are in season all summer long, and everyone tries so hard to figure out what the flavor of the jelly glaze is... red currant. I never really had "go to recipes" for the summer. Like I said it isn't my time of year. I melt like Frosty and wait to be reborn in the winter. Colorado and Vermont are the top two places my husband and I are thinking about moving to when the kids get out of school. 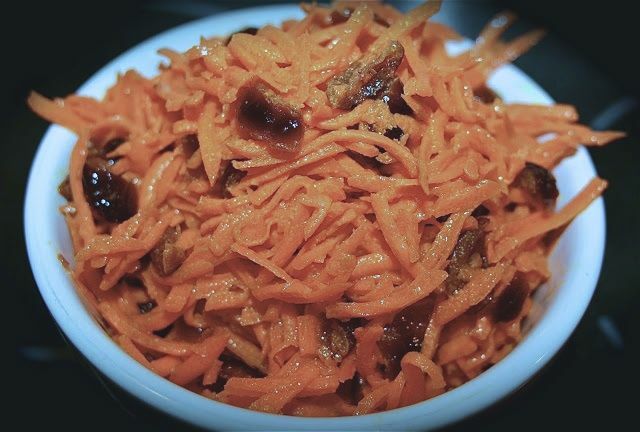 Thanks to Dorie I now have a salad that I can always take to a summer party: Cafe Style Grated Carrot Salad. Everyone likes carrot salad. This version is in a vinegar mustard base, so I don't have to worry about it spoiling sitting out all day... and it tastes just different enough to make it special. On a hot lazy summer day most Americans will russell up a burger or buy a pizza for a quick meal. (Both are at the bottom of my dinner list.) I think nothing of sauteing a piece of fish. 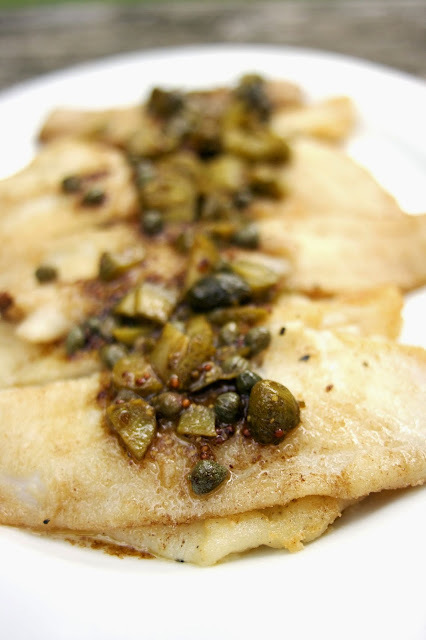 I often make Dorie's: Sole with Capers, Cornichons and Brown Butter not because I love it so much, but because I always have the ingredients for it on hand. This sauce works well on any white fish. I've put it on tilapia, cod and haddock too. Having to choose recipes for this posts I now really see how Around my French Table has influence what we eat in my family. I never made any of these recipes before I joined French Fridays with Dorie, I never made any version of these recipes... it is amazing how much Dorie has broadened mine and my family's palate. Marvelous list, Diane! I need to make that sole again now that Bill has eaten and enjoyed white fish (a first!). And it's time to pick up some cottage cheese and revisit those lovely tartines. Wow if Bill will eat white fish I would feed it to him every week to balance out the meat and potatoes. Yes, it is the time of year for the Dieter's Tartine. So glad that Dorie has opened your mind to new foods. This is a great list of favourites. More so than I realized. It is great we are writing these reflective posts to really force us to look back. She really has creeped into our lives, hasn't she. A few of her dishes have even worked their way into my annual Thanksgiving line up. And Vermont is my home! I love it there and you would too if you can handle the cold winters. I am leaning toward Vermont because it would keep me closer to my family. A great list, all delicious. 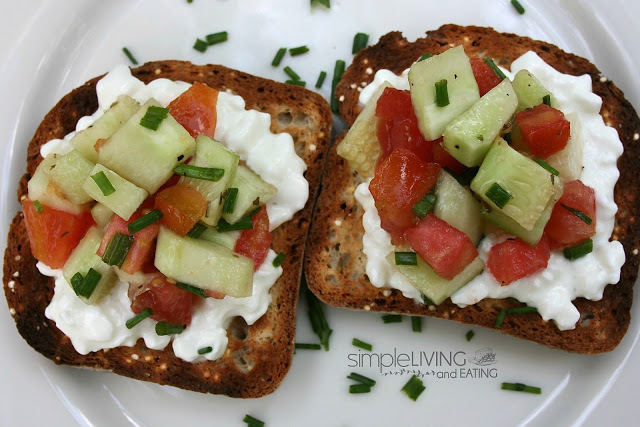 Cottage cheese on toast was always a great diet food for me. What a great list Diane. I think I missed that tartine somehow, but I think it would be great with the fresh cucumbers! Of course, a tart is always wonderful. I'm happy for the reminder about that salad, I really liked that! And the fish. 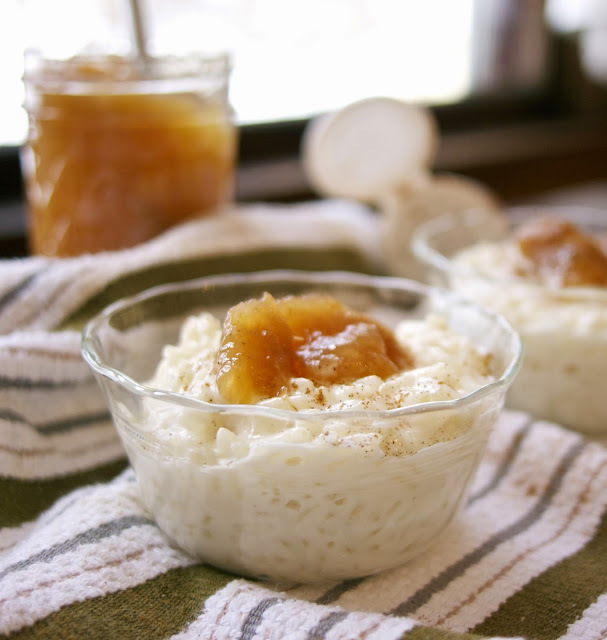 You can't go wrong with a great rice pudding either. So your hubby makes peach jam? One of my signatures is habanero peach! You can either make it like pepper jelly (1 c of pureed peach + 1 habanero), or just add 1 habanero to a recipe of peach jam. I have people who count on me for their fix each year! Of course, any home made peach jam is amazing. I know that I have to get on a roll! Thanks for your list! Great choices!!! I like the idea of making a spicy peach jam that would be better for savory dishes. I will tell my husband. We don't get the jam every year because our organic peach trees don't always make it each year. I appreciate now after trying to grow peaches organically why they are so expensive to buy. Great list! I have yet to make that Sable Breton Galette with Berries but I am now sold and sure it will be just the thing in the next couple of weeks! 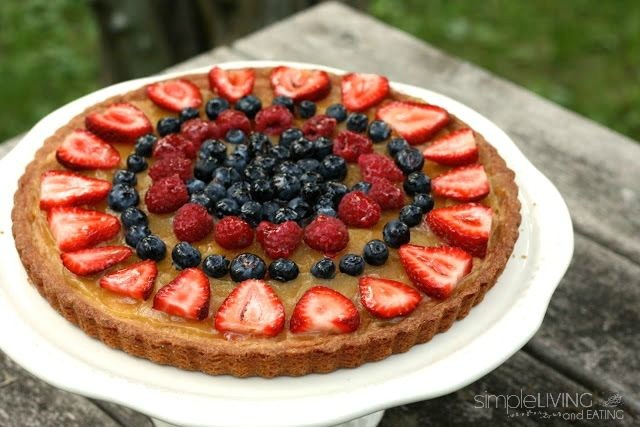 I didn't realize you hadn't made the Sable... a must for the 4th of July or Bastille Day! Nice list! I've always thought of cottage cheese as a refreshing summer food, rather than diet food, and that tartine is perfect for a hot day. My memories are of 1970's moms in restaurants picking at cottage cheese on a bed of lettuce while sipping on Tab and looking very unhappy. Everything looks delicious! I always liked cottage cheese . We eat it topped with olive oil and chopped tomatoes. The grated carrot salad and rice pudding look great! I like your cottage cheese recipe. I will try that soon. I like your list, except for the cottage cheese. I can't get out of the anti-cottage cheese camp. It's a texture thing. I think I made that tartine with ricotta. Nice list Diane! I am also in the anti-cottage cheese camp. If I could find fresh like you have maybe I could change my mind. I don't know though, I use a soft goat cheese when I make the tartines. Well going to try your Tartine first. I like cottage cheese so this looks delicious. Then I think your Sable Brenton Galette with Berries is going to a 4th of July party for sure. Thank you for sharing with the Clever Chicks Blog Hop! I hope you’ll join us again next week! Nice list! And good reminders that a little adventurousness can pay big rewards. I have not made any of these and they all look great for summer. More to add to my list. I agree with you that Dorie has definitely upscaled my eating. I miss my Friday crew already. I just want to come to your house and eat all this fantastic food! I sure hope that you'al are ok up there, I saw on the weather where you had some really bad storms, hope it wasn't near you and your family. Thanks so much for sharing your post with Full Plate Thursday and have a great day! Fun post. These are all great choices. Now that we're starting the season of fresh tomatoes and cucumbers, I really appreciate the reminder of the tartine.